Dress up your office or desk decor with this elegant nautical-themed sorter. Not only will you be better organized with this desk accessory, but also no one will ever know how EASY it was to make. The beads, thread and tape make it fast and charming. space around your traced outline. line it up on the organizer. Once it is in place, you can peel off the rest of the white liner and smooth down the entire piece of tape. Repeat this process for your two side pieces. 4. You are read to begin embellishing. Peel back the tape from your front panel. 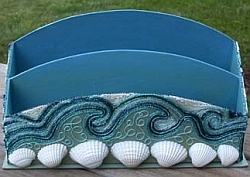 Arrange your shells along the bottom of the organizer. above this line. Beneath it, we have created a loop design. organizer back into it. This time, pour your Diamond Beadlets over the remaining exposed areas of tape. Tap to remove excess beadlets. 7. Repeat steps 4-6 for each side of your organizer. 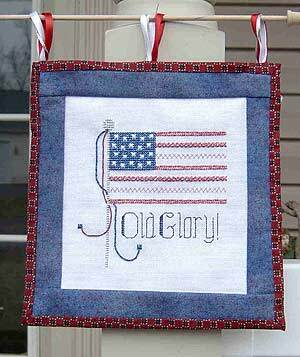 Once all three sides have been embellished and beaded, you are ready to organize! © Copyright 2007 Kreinik. May be reproduced but not sold.